This Christmas, the journey ends. $72.629 million on 3703 screens. Before 2003’s The Lord of the Rings: The Return of the King hit screens, virtually everyone regarded it as an inevitable slam-dunk. 2001’s The Fellowship of the Ring established the glory and majesty of Peter Jackson’s take on Middle-earth, and it also indicated that a movie about hobbits, dwarves and elves could earn massive box office bucks and enormous critical praise. 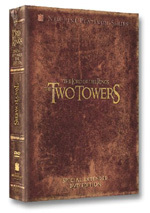 2002’s The Two Towers proved that lightning could strike twice. It received almost as many plaudits as the first flick and raked in even more money than its predecessor. Logically, King should have continued the trend, right? Yeah, but things don’t always work out that way. I’m in the minority, but I think that the bar was set so high that King could have faltered and ended the Rings trilogy in a moderately poor way; I never feared it’d be a dud, but given the enormous expectations, it easily could have turned into something of a disappointment. Happily, Jackson proved me wrong. Arguably the strongest of the trilogy, King provides a slightly flawed but generally overwhelming, magnificent and wholly satisfying conclusion to the epic. While Two Towers picked up literally where the prior film ended, King went with a bit of a flashback. We see how Smeagol (Andy Serkis) first came upon the One Ring and killed to acquire it. The film then quickly follows his path through the years, as we see the ring’s negative effect on him and his transformation into creature called Gollum. The movie then comes back to the main story, as we see Gollum lead hobbits Frodo Baggins (Elijah Wood) and Samwise Gamgee (Sean Astin) toward Mordor, where they plan to destroy the ring. Desperate to reacquire the ring, he plots to take the hobbits on a perilous path. They intend to get to Mordor, where Frodo can finally dispose of the ring. Gollum has other aims for his “precious”. In the meantime, the other members of the Fellowship of the Ring attempt to help Frodo in an indirect way as they gird for battle with the forces of evil lord Sauron. Towers concluded with the defeat of Saruman the White, but that didn’t end the fight. Actually, it just acted as the prologue for as they gird for a bigger battle against Sauron for the fate of Middle-earth. This will take place in Minas Tirith, the lead city of Gondor, but King Theoden (Bernard Hill) of neighboring realm Rohan – the folks who just fought Saruman’s army – seems too proud to send his help without being asked. To that end, Gandalf (Ian McKellen) goes to Minas Tirith to tell the Denethor (John Noble), the steward of Gondor, to do so. He refuses, so Gandalf lights the signals for assistance anyway. He and hobbit helper Pippin (Billy Boyd) deal with things there while Theoden and the others get themselves ready for the big fight. By the way, Denethor is “steward” because his family has acted as temporary guardians of Gondor for centuries. The real leadership belongs to the heir of Isildur, who just happens to be our buddy Aradorn (Viggo Mortensen). Much of the movie follows his quest to accept his birthright and return to throne; ergo, the movie’s title! For the two-second recap, here’s what I’d say: Frodo and Sam try to destroy the ring while everyone else fights. However, I’m not even sure what point there was to any synopsis. If you’ve already seen the first two movies, you’ll know where the story will lead. If you’ve not watched those, you’d be nuts to start here. Like many people, these films brought me onto the Rings bus. With each flick, I became more and more interested in the series, and King was the one that most impressed me during its theatrical run. Frankly, neither Fellowship nor Towers rocked my world during my initial screenings, but King really thrilled me. In fact, it’s the only one I liked enough to see it a second time while still on the big screen. Since I devote so much time to DVD viewings, I rarely see any movies theatrically, so for me to take in one twice shows just how much I liked King. Not that I regard it as a flawless flick. Probably my two biggest complaints relate to the “deus ex machina” factor as well as the endings. The latter category mostly seems to annoy folks who never read the book. So I don’t get into spoiler territory, I won’t directly discuss the conclusions, but note that the plural I wrote wasn’t a typo; King indeed presents quite a few scenes that seem to conclude the flick but don’t. I admit I don’t particularly care for this aspect of the movie. Individually, each of the apparent endings works fine; some are better than others, but all of them succeed. The problem simply stems from the abundance of conclusions. These make the finale seem somewhat anticlimactic and wear out the audience to a degree. Rather than elicit the sense of glory and emotion desired, many mostly feel happy to see the darned thing finally end. Most defend the endings with a very appropriate – and fairly accurate– claim that all these scenes come straight from Tolkien. However, I don’t think that just because something appears in the book that the film must use it. Jackson, et al., made many alterations from the original text, so there’s no reason they were particularly beholden to present the endings in this way. It’s probably a no-win situation for Jackson; if he’d edited the ending more tightly, the Tolkien fans would have been displeased. Personally, I don’t find the extended denouement to be a real problem, but it detracts moderately from an otherwise concise experience. I will acknowledge that the more I see the movie, the more I like the “multiple endings”. I truly disliked them the first time, and I still didn’t think much of them the second. However, with this third screenings, I’ve really started to warm up to them. They possess more of an emotional impact than I previously felt. I still can’t say I’m totally sold on them, but I’ve definitely gained a greater appreciation for them. As for the issue related to the deus ex machine factor, this also bothered me more substantially when I first saw the flick theatrically. Upon subsequent viewings, these elements seemed less cheesy and prominent. Still, the impression remains to a certain degree. The movie features an awful lot of sequences in which something comes out of nowhere during desperate situations to save the day. This gets a little old and feels a bit too convenient. However, I should reiterate that my complaints truly remain minor. The vast majority of King works extremely well, and one could easily argue that it presents the best of the three flicks. For me, one surprising strength came from the computer effects. I often loathe CGI, as I think it frequently works very poorly. Indeed, if you look back at my review of Fellowship, I noted the computer elements as one of the weakest parts of the movie. That didn’t occur here. Sure, the occasional shot works less well than one might like, but on the whole, the material seems surprisingly believable and well integrated. During Fellowship - and Towers, to a lesser degree – the CG occasionally took me out of the story. That never happened in King, as I remained firmly entrenched with the tale. Clearly the folks behind the effects learned a lot from flick to flick, and the quality of the results showed that. However, King doesn’t triumph just because it looks good, though indeed it does. The movie feels like the most epic of the trilogy and packs a real punch in that way. Nonetheless, all the spectacle never overwhelms the human elements, partially because the Frodo/Sam side of things sticks with a much smaller scale. They never deal with masses of characters, and much of their interaction involves their own trials and attempt to persevere. Wood does a fine job as Frodo, but Astin really steals the day for his work as Sam. Frodo’s assistant acts as the emotional heart of the film and really makes sure that Frodo doesn’t stray from his quest. Astin makes Sam more than just a loyal lap dog, though. Sam may not be the smartest or bravest character in the movie, but his dogged determination to fulfill his oath to Frodo becomes powerful and touching. The scenes in which Frodo starts to reject Sam seem tough to watch, as you just can’t help but feel bad for the compulsively down-to-earth and simple-minded – but not stupid – Sam. Astin manages to make sure that Sam comes across as likable and worthy of our admiration but he avoids any simplistic heart-tugging. The more that I consider what I liked about The Return of the King, the more difficult I find explanations to be, for there’s so little that I don’t like about it. Suffice it to say that it offers a rousing and stunning conclusion to arguably the greatest film trilogy ever made. I can – and did – quibble about some choices, but ultimately the movie offers a winner that completely deserves all of its praise and awards. 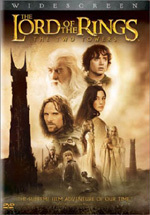 The Lord of the Rings: The Return of the King appears in an aspect ratio of approximately 2.35:1 on this single-sided, dual-layered DVD; the image has been enhanced for 16X9 televisions. Both Fellowship and Towers looked great on DVD, and King follows suit with another fine transfer. No issues related to sharpness ever occurred. Despite the many very wide shots that occurred, the image remained rock solid. I saw no softness at all, as the picture appeared crisp and detailed. I also detected no jagged edges or moiré effects, and edge enhancement seemed absent. Those in search of print defects will hunt in vain, as I witnessed no specks, marks, or flaws of any sort in this clean presentation. As with the first two flicks, King continued to display a rather stylized palette. Here, three types of hues dominated. The Rohan elements went with something of a golden tone, while Frodo’s scenes mainly used a dingy blue/gray. Minas Tirith featured blown-out whites. The DVD clearly replicated the movie’s intended palette. The colors were appropriately vivid when necessary and seemed accurately depicted. Black levels also came across well. Dark shots demonstrated good depth and clarity. Low-light shots were nicely displayed and seemed clear and adequately visible. Shadow detail was clean and tight. Again, this was a very strong presentation that reproduced the movie swimmingly. For the Dolby Digital EX 5.1 soundtrack of The Return of the King, I found another fine piece of work. The soundfield appeared very active and involving. All five channels presented lots of material that kept the viewer at the center of a realistic and immersive world. Elements seemed appropriately placed and they blended together well. Flying creatures soared from location to location accurately, and other pieces popped up in their proper places too. The whole thing meshed together quite nicely, and the piece worked nicely. Not surprisingly, battle sequences were the most impressive, but the entire package seemed strong. Audio quality equaled the positive nature of the soundfield. Speech was natural and distinctive, and I detected no issues connected to intelligibility or edginess. Music sounded bright and vibrant, as the score presented rich and full tones. Effects came across as accurate and concise. No problems with distortion appeared, and these elements were clean and broad. On occasion, bass response came across as a little overcooked, though not terribly so. Still, I found much to like in the fine soundtrack of King. 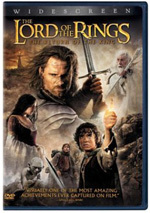 Probably about six months after this initial DVD release of The Return of the King, New Line will produce a super-special edition that packs hours and hours of extras. Because of that, this two-disc set seems destined to become regarded as the “bare bones” version. That notion seemed less acceptable for the first two movies, as their two-disc releases included some nice pieces. The extras for King appear substantially less satisfying, unfortunately, as nothing terribly compelling shows up here. We open with The Quest Fulfilled: A Director’s Vision. It runs 23 minutes and offers the typical mix of movie clips, behind the scenes materials, and interviews. We get remarks from director Peter Jackson plus Weta Workshop creative supervisor Richard Taylor, co-screenwriter Phillipa Boyens, executive producer Mark Ordesky, Tolkien publisher Jane Johnson, cinematographer Andrew Lesnie, and actors Elijah Wood, Dominic Monaghan, Ian McKellen, Viggo Mortensen, Sean Astin, Orlando Bloom, Billy Boyd and Miranda Otto. “Fulfilled” covers some general topics. We hear about Jackson’s energy and style, his path to bring the story to the screen, shooting the massive Pelennor Fields scene, and casting. If you’ve already gone through prior DVDs, you’ll know almost all of this information. The program feels more appropriate for the Fellowship DVD, as it goes through very introductory issues for the most part. It repeats an awful lot of material from earlier discs. Outside of some decent production footage from King, this feels like a very redundant and superfluous promotional piece. A Filmmaker’s Journey: Making The Return of the King lasts 28 minutes and 30 seconds and uses a format similar to that of the prior show. We get interview snippets with Jackson, Boyens, publisher Rayner Unwin, Johnson, Ordesky, Taylor, Lesnie, Tolkien expert Brian Sibley, composer Howard Shore, producer Barrie M. Osborne, conceptual artist Alan Lee, costume designer Ngila Dickson, and actors Wood, Astin, McKellen, Boyd, Mortensen, Otto, Bloom, Monaghan, Christopher Lee, John Rhys-Davies, Hugo Weaving, Liv Tyler, Andy Serkis, Cate Blanchett, Ian Holm and David Wenham. Another general program, “Journey” starts with some history about Tolkien’s text and then goes through prior potential film versions and its path to the screen, adaptation issues and Jackson’s style, casting and actor training, costumes and props, music, and the adaptation. Like “Fulfilled”, “Journey” seems pretty redundant. A lot of the same clips and interviews appear in both, and only a smattering of material specific to King can be found. Very little that we didn’t hear on prior DVDs pops up here. It’s more inclusive and better than “Fulfilled”, but it remains too general, promotional and redundant to serve much purpose, at least not for mildly knowledgeable fans. The DVD’s longest show, the National Geographic Special lasts 45 minutes and 55 seconds. Called “Beyond the Movie”, it features the standard components, and we get notes from Jackson, Wood, Weaving, Astin, Boyens, McKellen, Boyd, Bloom, Lee, Wenham, Rhys-Davies, William Wallace re-enactor Jock Ferguson, historian Dr. Fiona Watson, Tolkien expert Professor Michael Drout, Theodore Roosevelt’s great-grandson Tweed, author Dr. David Loades, University of Pennsylvania Professor Michael Zuckerman, Harvard University Professors Dr. Allen Counter and Dr. Richard Pipes, Royal Military Academy Sandhurst Dr. Areyah Nusbacher, Princeton University Professor James McPherson, RAF pilot Wing Commander Bob Doe, University of Nebraska Professor Gary Moulton, and Robert Peary’s great-grandson Robert Peary Stafford. ”Beyond the Movie” attempts to connect Rings characters and situations with historical personalities and actions. It quickly delves into topics such as Scot leader William Wallace, Theodore Roosevelt, Queen Elizabeth I’s advisor William Cecil, Benjamin Franklin, Rasputin, World Wars I and II, the Battle of Agincourt, Gettysburg, Lewis and Clark, the partnership of Edmund Hillary and Tenzing Norgay, and Matthew Henson. This sounds like a good idea, but it seems only sporadically successful. The concept of real-world connections comes across as intriguing. Unfortunately, the program rips through things so quickly and makes so many vague associations that the whole thing feels less than satisfying. It has its moments, but in general, it doesn’t do much for me. In the section called Lordoftherings.net Featurettes, we get six of these pieces. They run between two minutes, 16 seconds and four minutes, 37 seconds for a total of 21 minutes, 59 seconds of material. The various programs focus on the character arcs of Aragorn, Eowyn and Sam, Minas Tirith, the Battle of Pelennor Fields, and the digital creation of doubles for horses. Jackson, Mortensen, Osborne, Lee, Rhys-Davies, Wood, Boyens, Otto, McKellen, Wenham, Boyd, Taylor, Monaghan, Astin, miniature unit director of photography Alex Funke, supervising art director Dan Hennah, digital model supervisor Matt Aitken, director of animation Randy Cook, visual effects supervisor Joe Letteri, and actors Karl Urban and Bernard Hill. Only two of the featurettes seem genuinely interesting: “Minas Tirith” and “Digital Horse Doubles”. While we’ll unquestionably learn substantially more about these topics in the four-DVD King package, both offer brief but useful examinations of the nuts and bolts behind them. Unfortunately, the other four appear much more pedestrian and lackluster. They cover fairly general notions and don’t add much to our appreciation of the films or our understanding of them. Within the Theatrical Trailers section, we find two promos, simply titled “Trailer One” and “Trailer Two”. TV Spots includes an additional 14 ads. 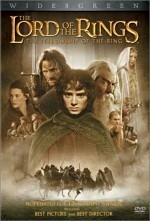 A more interesting piece, the Lord of the Rings Trilogy Supertrailer runs six minutes, 38 seconds. Basically a really quick version of the movies, it’s kind of cool to see something that packages all three flicks together in this way. Yet another promotional preview tells us the The Battle for Middle-earth Continues - Video Games from EA. In this 182-second clip, we see some images from a couple of products. Don’t expect more than an attempt to sell them to you. Lastly, Towers features some DVD-ROM materials. We find two different weblinks. One goes to the official movie website at Lordoftherings.net, while the other provides “exclusive online content”. As I checked this out four days before Towers hits the street, the link didn’t work. One very nice element of the DVD’s extras: they include English and Spanish subtitles. Only a couple of studios consistently add text to the supplements, so it’s good to see this here. I think subtitles for extras should be the rule, not the exception. 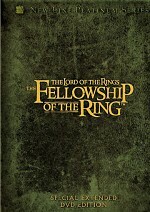 A terrific conclusion to a remarkable trilogy, The Lord of the Rings: The Return of the King provides a real winner. It moves quickly, keeps us involved and excited, and pays off with a satisfying and emotional finish. The DVD offers excellent picture and audio but only includes a fairly superficial and redundant roster of extras. I definitely recommend The Return of the King, though I do so with the caveat that you really need to see The Fellowship of the Ring and The Two Towers first. Note: as I mentioned earlier, New Line will produce a much more elaborate DVD package of King about six months after the release of this two-disc set. That version will include a substantially longer cut of the film as well as tons of extras not found here. None of this package’s supplements will also appear on the “deluxe” set. This two-DVD release will also remain the only way to see the original theatrical version of the film.